There are several techniques suitable for measuring and modelling dispersion from scalar or velocity-field measurements in a turbulent flow. Each of these has peculiar features and sometimes, even different scaling, and a careful choice has to be made depending on the kind of information available and needed. A useful way to investigate diffusion is to make use of the fractal and multifractal information that ocean and atmospheric flows provide. 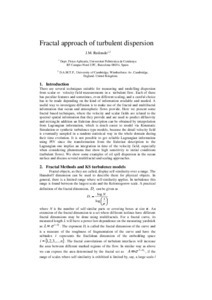 Here we present some fractal based techniques, where the velocity and scalar fields are related to the spectral spatial information that they provide and are used to predict diffusivity and mixing.In addition an Eulerian description can be obtained by interpolation from Lagrangian information, which is much easier to model via Kinematic Simulation or synthetic turbulence type models, because the detail velocity field is eventually sampled in a random statistical way in the whole domain during their time evolution. It is not possible to get reliable Lagrangian information using PIV since the transformation from the Eulerian description to the Lagrangian one implies an integration in time of the velocity field, especially when considering phenomena that show high sensitivity to initial conditions (turbulent flows). We show some examples of oil spill dispersion in the ocean surface and discuss several multifractal and scaling approaches. Redondo, J. Fractal approach of turbulent dispersion. A: Journées Scientifiques de l'Université du Sud Toulon-Var. "Workshop TURBINTERMED 2010 : Turbulence and Internal Waves in Mediterranean Sea". Toulon: CNRS, éditeur, 2010, p. 1-7.